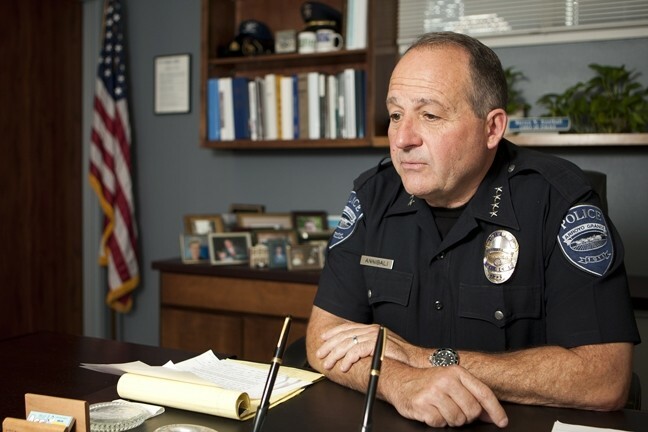 Arroyo Grande Police Chief Steve Annibali’s gun, badge, and police ID were stolen from his unmarked take-home police vehicle late on July 7. “I walked out on Monday morning, noticed glass shattered across the sidewalk, and I said ‘uh oh,’” Annibali told New Times. ‘UH OH’ : A driveway full of mulch prompted Arroyo Grande Police Chief Steve Annibali to park on the street, where a thief smashed his car window and stole a pouch holding the chief’s gun and badge. The chief said the items were in a small black emergency response bag stashed under the rear passenger seat. The thief broke the rear passenger side window, grabbed the bag, and took nothing else, he said. Annibali parked the car on the street because his driveway was full of recently delivered mulch. He added the incident has prompted his department to seriously review all of its practices and procedures about storing police equipment, including the definition of “secure” when it comes to police vehicles. Annibali said he was unsure what action the city manager’s office will take, but recommended he be held to the same standard as any of his officers.